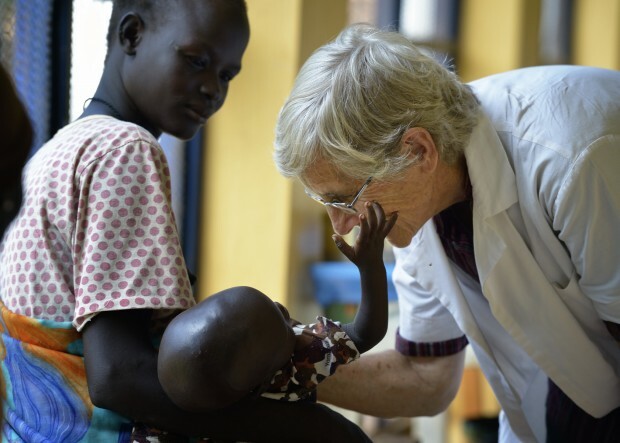 WAU, South Sudan (CNS) — Catholics from around the globe are playing a key role in building a health care system in the world’s newest country. It’s a daunting task: Following decades of war, South Sudan is only halfway through its second year of independence. There is little infrastructure. Trained health personnel are few. The nation has the world’s worst maternal mortality rate, and its infant mortality rate is not far behind. Yet the Catholic bishops of South Sudan were determined to change that, and in 2004 — as the country was about to formally end its long civil war — they invited an international network of religious orders and congregations to start training nurses and midwives at a medical training school in Wau. The bishops built the school in 1980 but were forced to close it in 1983 as fighting engulfed the area. When members of Solidarity with South Sudan finally arrived in Wau in 2008, they found most of the buildings ransacked. Displaced families lived in the ruins. Solidarity — which today has 32 members in South Sudan, seven of them based in Wau — began to rebuild the school and student dormitories. In 2010, the Catholic Health Training Institute started classes for registered nurses. In 2012, it added a course for registered midwives. 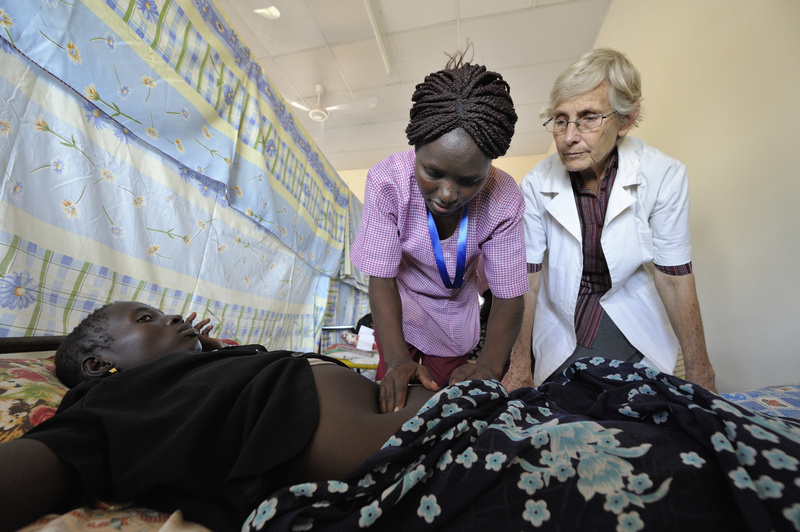 Sister Dorothy Dickson, a member of the Sisters of Our Lady of the Missions who serves as the institute’s director, said adequately trained nurses and midwives are in short supply. “Because of the war, medical training was sporadic and short. Someone might become a nurse after going through a three-week course in nutrition, a two-week course in malaria, and one week studying cholera. Formal training of registered nurses simply didn’t happen. And no one would start a two- or three-year program because you couldn’t be sure how long you would be in one place before you’d have to flee from the fighting,” Sister Dickson, who is from New Zealand, told Catholic News Service. The government has temporarily imported some health personnel from neighboring countries but is pressing the church and other groups to get South Sudanese citizens trained as quickly as possible. The government’s Ministry of Health has worked closely with Solidarity in designing the health institute’s curriculum and selecting students, as well as channeling some U.N. funding to the school. English is the official language of the new nation, but the English requirement has been difficult for students whose basic education was in Arabic, the language of Sudan. Earlier this year a riot broke out at the government-run University of Bahr el-Ghazal in Wau, with students protesting the requirement that all teaching take place in English. Solidarity has provided tutors for its students that need extra help with the new language, but at least one student has been held back because of failing to gain necessary proficiency. Seventy-two students are currently enrolled in the two programs. Each diocese in the country sends two students to the nursing program and is supposed to pay the approximately $6,000 a year it costs to educate each student. “But the bishops are lucky if they can come up with $2,000 for each student they send us,” said the institute’s principal, Indian Sister Sneha Joseph, a member of the Missionary Sisters Servants of the Holy Spirit. While a few are sent back home to work supervised stints in hospitals there, most students get their practical experience locally at the government-run Wau Teaching Hospital and the diocesan St. Daniel Comboni Catholic Hospital. Yet working alongside the regular nurses in the two hospitals did not work well at first. The existing hospital staff often lacked extensive formal training. “At first they weren’t willing to teach anything to the students, but after several months of talking and being with them, now they accept the students. They realize the students often know better than them, and some even ask the students for advice,” she said. The students also provide essential translation in the hospitals. Some English-speaking foreign doctors who work the wards do not speak Arabic, the primary language of most of the existing nurses, so the students translate. Barnabas Mbele is a nursing student from the Diocese of Rumbek. He told Catholic News Service that, despite the challenges, he is excited about becoming a nurse. “Nurses are the ones who care for the patient, but it’s not just about caring or giving drugs. You have to psychologically counsel the patient, encourage the relatives, and even promote good health practices. We should stop thinking that nursing is just giving drugs to patients. I’m interested in nursing because it is a broad vocation,” he said. Mbele is optimistic about the future and thankful for the presence of the Solidarity volunteers. “I’m happy we’re (South Sudan) independent, but we don’t expect big changes in a month or two. Change comes slowly, but the changes will come, with help from others like the Solidarity people. They’re working with us now so that we can work on our own tomorrow,” he said. I have personal experience of Sister Dorothy and Sister Sneha as we work with them during our visits to Wau teaching hospital as part of the Poole Africa Link. The training institute is truly inspirational, the students are well trained and delightful to teach. They will be the future of nursing in South sudan. A superb article, accurate and carefully composed. Congratulation to Paul J on this fine piece of writing.